Multiple Spindle Drill Heads are usually supplied with collet style spindles. Collet style spindles, with their compact design, allow close center to center distances. A customer with a special application asked whether a multiple spindle head could be made to turn four secondary operations at the same time with standard motor type shafts. When asked if simple shaft-type spindle outputs could be provided in place of the collet style spindles, we provided them as part of a custom multiple output shaft head. We provided the Four Spindle Drilling Head below as a solution to their problem. This simplified their previous operation which had used gears, pulleys, belts and motors to accomplish the same thing. It became a very compact and easy to maintain machine driving all four shafts at the same time with a one-to-one ratio. They did not need very close spacing, although close center to center distances are possible. 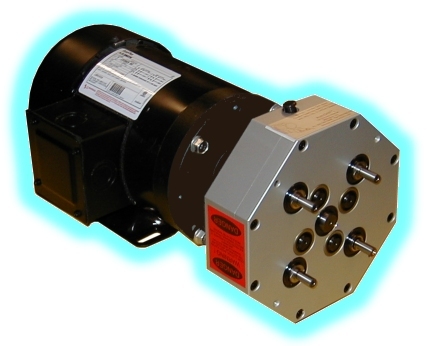 Also possible are increased or reduced rotation heads similar in many ways to gear reducers.